Forgot your password? Need to Recover Passwords and Confidential Information saved in your computer? Our Password Recovery Software Products can Really Help You to do it ! SpotAuditor - All In One Password Recovery Software Solution! 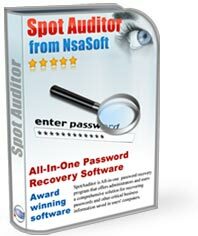 SpotAuditor is an advanced password recovery software for recovering passwords and other critical business information saved in users computers. SpotAuditor recovers passwords for more than +40 popular programs. Including passwords for aol, facebook, ebay, yahoo, gmail, hotmail, myspace, Internet Explorer, Firefox and Opera browsers. SpotAuditor recovers password for Microsft Outllok, Outlook Express, Gmil, Google Talk, Gmail Notifier, ICQ, Trillian, Miranda IM, &RQ, Camfrog Video Chat, Easy Web Cam, RDP, VNC, Dial up, RAS, VPN, WinProxy, Total Commander (Windows Commander), Far ftp client, WS_FTP, CuteFTP, File Zilla, FlashFXP ftp client, SecureFX ftp client, WebDrive ftp, FTP Voyager, CoreFTP, CoffeeCup Direct FTP, AutoFTP, FTP Control, FTP Navigator, FFFTP, 32bit FTP passwords and reveals IE Auto Complete Fields saved passwords, recovers software passwords stored behind the asterisks (*****). The program also explores Visited URLs, Installed Programs and Start Run Programs on a local machine or remote computers. You can save passwords as Tab Delimited Txt File (.txt), Excel Workbook (.xls), CSV Comma Delimited (.csv), Access Database (.mdb), Web Page (.html) or XML Data (.xml) file, Print or Copy to Clipboard. How to Find Internet Explorer Passwords? How to Recover SecureFX Passwords?